Their peculiarly successful work marriage—a comfortably malleable relationship in which he starred in films she wrote, she starred in films he directed, or they simply appeared together onscreen—became something of a tradition for them, and was a calling card of their careers. Not all their collaborations were deeply felt meetings of the minds, of course. Over the sprawling opus of the Harry Potter movies, for example, Rickman and Thompson barely even share the frame, even though they’re both Hogwarts instructors. They’re together by accident, part of a Brit-actor zeitgeist that assembled for the movies to establish a mythology. As a performer, Rickman left behind an impressive and eclectic legacy. But in a generation of those looking for a sense of the genuine beneath the performance, and those who respect the idea of actor as auteur, there’s something particularly touching about a friendship like the one he has with Thompson that plays out obligingly onscreen. Their camaraderie was impossible to miss, and their onscreen collaborations were always buoyed by the sense that they enjoyed being in one another’s company as much as we enjoyed watching the results. Below, their five most fascinating projects, from a friendship 20 years in the making. Emma Thompson’s passion project was an Oscar-winning adaptation of Austen’s first published novel, and proved to be an excellent opportunity for Thompson to gather a handful of British actors who have shared stage and screen in dozens of permutations. She wrote the role of the quiet but deeply felt Colonel Brandon with Rickman in mind, even though it was her first time working with him—not that you could tell, as their scenes carry the easy weight of a long friendship. The adaptation cut out the subplot where Mrs. Jennings suspects Elinor (Thompson) and Brandon’s friendship will end in marriage, but kept a scene in which Elinor’s own beau suspects she and Brandon are attached; given their chemistry, it’s no wonder. And yet, who needs high art all the time? From their opening stare, it’s clear that Rickman and Thompson are having the time of their lives: They lope gleefully through the B-plot, chewing on iffy Southern accents, rattling off good-cop cliches at one another at high speeds, and making offhand plans to hook up as soon as the case is cracked. Their energy is palpable, and any time they share a scene the movie lurches to life, pleasantly surprised, until the next gentle derailment. Rickman wasn’t entirely accurate to the onscreen dynamic when he told the Times, “It’s been sort of accidental, but I think we’re a good team. We play a kind of tatty Bogart and Bacall in this film—only Emma’s Bogart and I’m Bacall.” But in terms of sheer cheeseball enjoyment, it’s not far off. For a movie that’s so forcibly schmaltzy about the sustaining power of love, Love Actually’s best subplot is its most bitter. The intertwining arcs are decidedly hit or miss, and the actors tend to make or break it, so it would be no surprise for Rickman and Thompson run away with their material regardless. (Rickman’s scene-stealing was already legend by then, and Thompson is no slouch.) But their material also happens to be the most nuanced of the lot; Harry and Karen’s perfectly lived-in marriage comes apart, a slow disaster that’s all the more wrenching for how polite and fond it is. 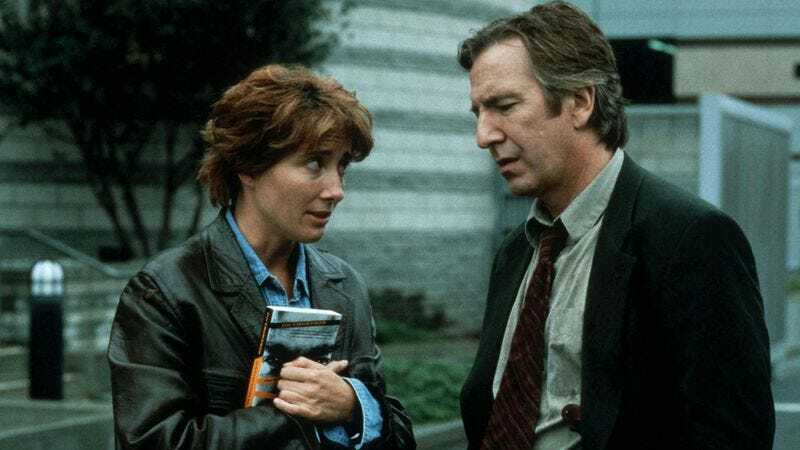 There’s also some built-in subtext; by now, Rickman and Thompson’s working partnership was well-known, so watching them as a married couple took on a level of comforting meta that just made the fracture worse. While Britain is positively overrun with charming actor collaborations that have become their own shorthand, the majority of those are comedy duos; few carry that unspoken, staunchly unexplored sense of might-have-been that Thompson and Rickman do. No surprise, then, that The Song Of Lunch (adapted from Christopher Reid’s poem) feels in some ways like the world’s biggest wink: Rickman plays a self-absorbed publishing type who reunites for a meal with the one who got away, to hash out old feelings, poke the bruise of what went wrong, and perhaps rekindle an old flame. (How meta is it? The cameo of Thompson’s novelist husband is none other than real-life partner Greg Wise.) The artistic experiment is less successful than it could be; living in Rickman’s head for 50 minutes turns out to be a slightly suffocating perspective. But their self-deprecating commentary on the passage of time and the connection that remains despite everything is, in the film’s best moments, like voiceover over what we already hope we know. It’s a pair of seasoned performers coming together to trade on nearly two decades of friendship; the result is, almost by accident, one of their most affecting collaborations.